Sundial and clock agree every year in middle April. It means that, when the midday sun climbs highest, the sundial reads 12 noon and your local clock says 12 noon. 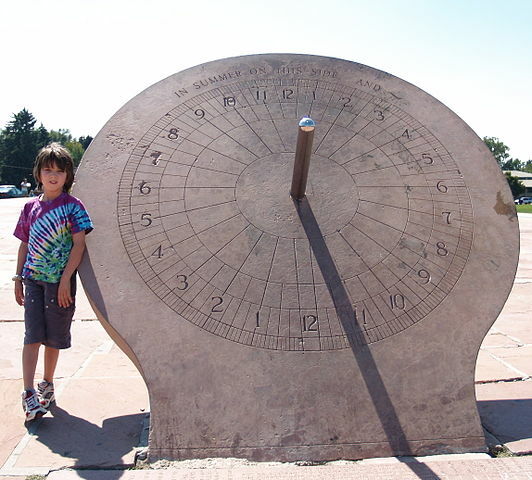 Equatorial sundial at Denver’s Crammer Park, when it is a little past 11:00 a.m. by the sun. (The shadow moves clockwise, with the afternoon hours on the left.) Click here for the equation of time in 2019. The image at the top of this post shows the equatorial sundial at Denver’s Cranmer Park, when it is a little past 11 a.m. by the sun. The shadow moves clockwise, with the afternoon hours on the left. Every year around the middle of April, time by the sun and time by the clock agree. 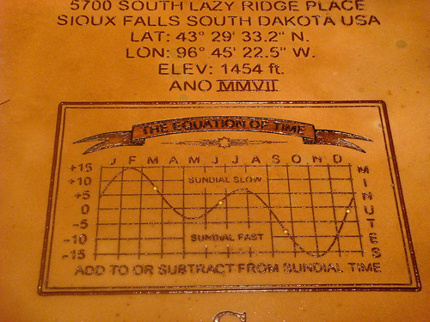 For instance, when the midday sun climbs highest in the sky in mid-April, this sundial reads 12 o’clock noon and the local clock time says 12 o’clock noon (1 p.m. daylight saving time). Your local clock time is the same as standard clock time, as long as you live on the meridian that governs your time zone. If you live east of the time zone line, then your local time runs ahead of standard time. If you live west of the time zone line, local time lags behind standard time. For simplicity, let’s refer to places that sit right on the time zone meridian, like Denver, Colorado, or Reno, Nevada. Midday – noon by the sun – reads 12 o’clock noon standard clock time or 1 p.m. daylight saving time. Click here to know the clock time for solar noon (midday) at your location, remembering to check the solar noon box. Cool sundial. Image via Flickr user kingston99. 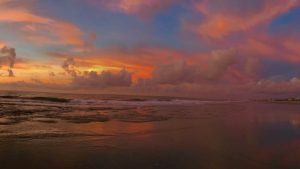 At present, the length of the day as measured by successive returns of the midday sun is slightly less than 24 hours long. This slight daily discrepancy between the clock and the sun will accumulate until mid-May. In mid-May, midday – noon by the sundial – will come four minutes earlier by the clock than it does today. After mid-May, day length as measured by successive middays (sundial noons) will become slightly more than 24 hours long. By around mid-June, noon by the sun and noon by the clock will agree once again. 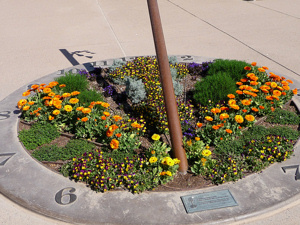 The sundial and clock agree four times a year: on or near April 15, June 15, September 1 and December 25. Want to know the equation of time (discrepancy between the sundial and clock in minutes) for every day of the year? 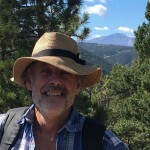 Check out this Ephemeris of the Sun for 2019. In February, the clock is a maximum of about 14 minutes ahead of the sun (solar noon = 12:14 p.m. clock time). In late October/early November, the clock is a maximum 16 minutes behind the sun (solar noon = 11:44 a.m. clock time). 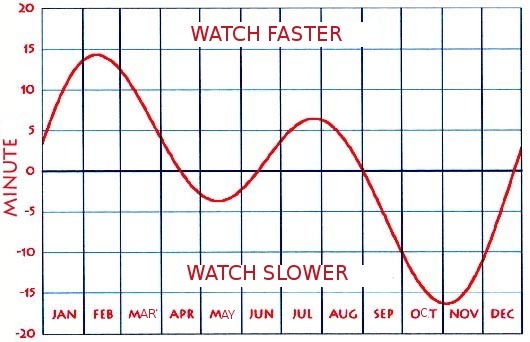 On or near April 15, June 15, September 1 and December 25, the sun and clock agree. Bottom line: Every year in mid-April, clock time and sun time agree. When the midday sun climbs highest, the sundial reads 12 noon and your local clock says 12 noon.